Akhilesh Yadav's appointment today confirms the marginalisation of Mulayam Singh in the party he launched 26 years ago. Only last week, he had reminded his son of his promise that he would return the party chief's post to his father after Uttar Pradesh assembly elections held in March this year. 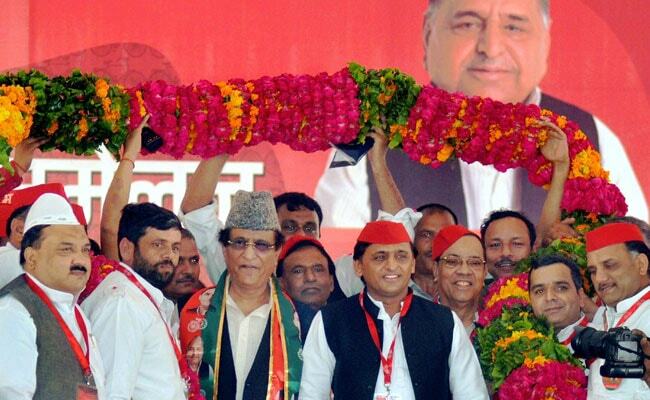 AGRA: Mulayam Singh Yadav skipped the national convention of the Samajwadi Party on Thursday where his son Akhilesh Yadav was unanimously elected national president for a five-year term. Mr Yadav junior has held the top post since earlier this year, when he ousted his father in a coup at a party meeting, promising then that it was a temporary arrangement. Akhilesh Yadav's appointment confirms the marginalisation of Mulayam Singh in the party he launched 25 years ago. Only last week, he had reminded his son of his promise that he would return the party chief's post to his father after Uttar Pradesh assembly elections held in March this year. As Akhilesh Yadav sought re-election as UP's chief minister, Mulayam Singh did not even campaign for the party. The Samajwadi Party suffered an ignominious defeat at the hands of the BJP. Akhilesh Yadav's re-election as party chief was announced by his uncle Ram Gopal Yadav at a national convention of the Samajwadi Party. Rules have been changed to extend the tenure of the party chief to five years from three. It ensures that Akhilesh will lead the party for the 2019 Lok Sabha elections and then state Assembly elections in 2022. Party workers celebrated the announcement to drum beats. "Akhilesh Yadav is the only one who can deliver on his promises to UP. This (BJP) government is doing nothing," a Samajwadi worker told NDTV. Though Mulayam Singh was missing, his giant posters and cut outs dotted Agra. Last week, Akhilesh Yadav had visited his father's Lucknow home, their first meeting in months, to invite him for the party convention, raising hopes of reconciliation. Akhilesh said he had requested his father to attend the meeting. "Everyone would have liked his presence," he said. "I received my father's blessings over the phone," Mr Yadav said at the end of the national convention. Last evening, Mr Yadav also claimed his uncle and political nemesis Shivpal Yadav also called to congratulate him. In a concession to his son, Mulayam Singh had 10 days earlier decided against launching a new party "as of now". One of the points of disagreement between the father and son has been the alliance with the Congress that Akhilesh had scripted along with Congress vice president Rahul Gandhi. Akhilesh Yadav has stressed there was not going to be any change on this point. "Our friendship will remain," he said yesterday. The party instead has kept their attacks sharply focused on the BJP, both at the centre and in the states. "This government is remote controlled from the centre, the public is already missing Akhilesh," said senior SP leader Ram Gopal Yadav. "Our key task now is to unite to stop the BJP," said Samajwadi Party Rajya Sabha MP Neeraj Shekhar to NDTV. But the party ducked questions on the possibility of tying up with Mayawati's Bahujan Samaj Party as part of this unity drive. "When we are civil to each other, you immediately presume there will be a coalition," said Akhilesh Yadav, referring to Mayawati. "This is my manner, I am always civil."